My new site! What can I do better? I work with music and theatre. Feel free to post comments or ideas here. • Is it easy to get an idea on what I do? • What would I need to do more? I really liked your page, It’s light and fresh and not a lot of disturbing elements. I agree with @Jakerlund, less is more and you have done a great job of simplifying the design of your website without losing anything. The only thing I would suggest is using the different text styles for the page titles (videos, projects) and the project titles (Musikteater Unna, etc). But even in the current state, it looks ok.
Clean and compelling composition. It leaves the audience needing to explore deeper, especially with that initial image. Thanks for the replies! That was really nice to hear! @Eldar, I will look into your suggestion and change the fonts in the page titles! 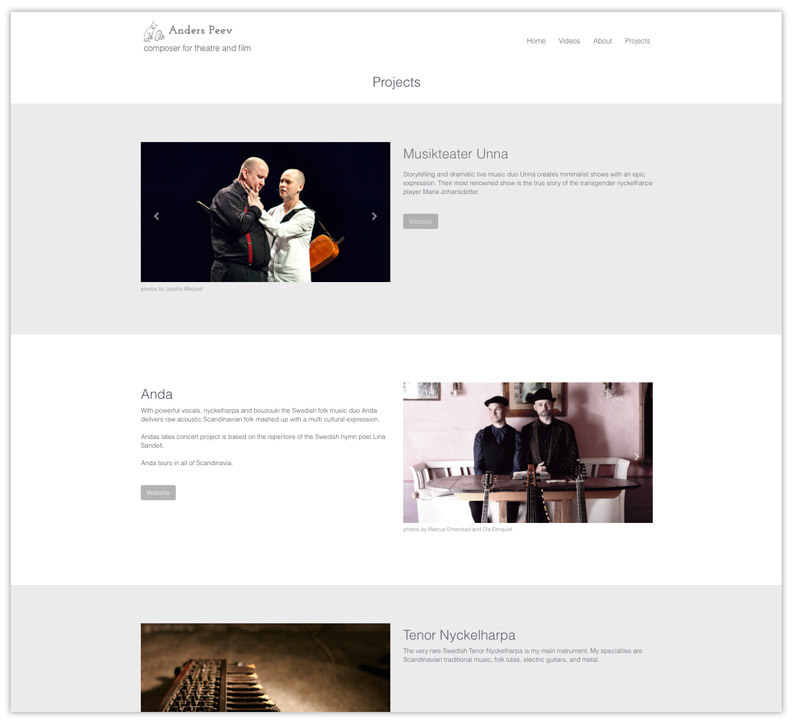 Two of the projects on the projects page have their own logos, since they are a band and a theatre group ( Anda & Musikteater Unna). Should I use their logos in the projects page? Or is it better just to have the fonts that I use now? I agree with @Eldar about the fonts, they don’t stand out enough right now. I would include the band and theatre logos for stronger branding and recognition. I would agree with the earlier comments. On the projects page I would be tempted to try two things and choose one ( or none ) of them. I’d consider making alternating blocs to have a slightly different colour background (very, very subtly different), so the blocs are delineated. I might even do that for the navigation. People often use that technique for table rows. Really nice work though - on the site and your production. @Nanoq I totally agree with @pauland about the row colouring. That’s a very good point! It would make the different projects clearly separated from each other. I will experiment with this. Thanks for the creative input! I have also been thinking of having photo-backgrounds but can’t think of any motive that wouldn’t make the whole site messy. The idéa would perhaps be that a photo-background would add something to the storytelling of my work.